Last week I had the opportunity to travel to Jackson for a meeting with Wyoming's ENDOW Council. ENDOW stands for Economically Needed Diversity Options for Wyoming. Through the leadership of Governor Mead, we spent two days with representatives from Singularity University discussing how to instill an exponential mindset and think about the future in new ways. 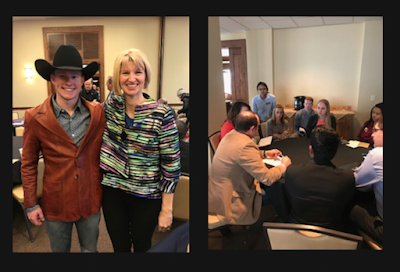 Governor Mead invited a student from each of Wyoming's Community Colleges and the University of Wyoming to participate. Chemical engineering major, Gareth Flowers, (pictured with me below) was selected as NWC's student representative. During one of the sessions, the Governor's Director of Economic Diversification Strategy and Initiatives, Jerimiah Reiman, held a focus group with the students to begin planning a statewide economic diversification summit for high school and college students. Gareth Flowers and President Hicswa/Jerimiah Reiman with Gareth and other student reps.